This site is where I host the Avatar sprites that I have made, and where others can come and adopt them. I hope to eventually make sprites/chaos for all of the notable characters and costume variations, but it is a (very) long-term goal/hobby. The sprites are also used as ranks at the DH Forum, where you can also make requests for what new sprites you would like to see. Avatar: The Last Airbender is an American Nickelodeon cartoon that first aired in February 2005, and had appeal world-wide in nearly every demographic. It had three seasons, and spawned comics, video games, amusement rides, a disappointingly mishandled movie, and a new cartoon sequel, The Legend of Korra. Korra takes place 70 years after ATLA and will air on Nickelodeon starting April 2012. 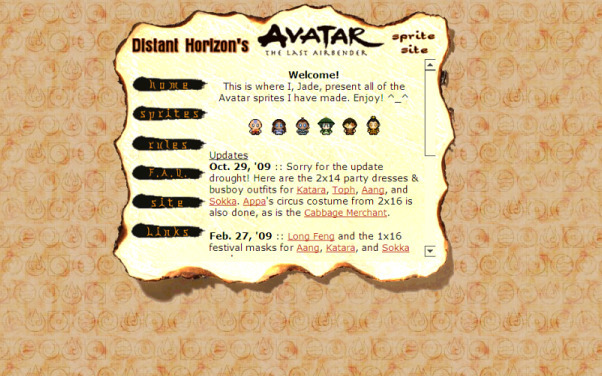 The DH Sprite Site was opened on August 6, 2005, although before then it was originally a single page on my main Avatar fansite, Distant Horizon. I started making these sprites back in late March '05, beginning with Haru. After a while though, I felt all of the sprites were out-growing that single page, so I created a new site for them. The banner image features the cover art from the ATLA Art Book (art by Bryan Konietzko), as well as a re-drawn image of a Korra design that was on a t-shirt from SDCC '11. (redrawn by me, in GIMP.) The background is a gray-scaled version of the background from the first layout. This layout utilizes PHP, CSS, and an image map, with coding written in Notepad. The parchment paper image is from Taxi of GettyImages.com. It was altered in Paint Shop Pro 7, which is the same program that I made the background with. The Nation symbols in the bg are from brushes which you can find here, and are designs from the ATLA cartoon. This layout used an image map, iframes, and tables, with the html written in Notepad. I am Jade, a slightly lazy twenty-something year-old who keeps on making stuff. Some years back I started an Avatar fansite called Distant Horizon, and have been trying (or not) to keep up since. I enjoy making stuff almost as much as I enjoy being lazy, which usually leads to unreliable update schedules. I'm sorry. 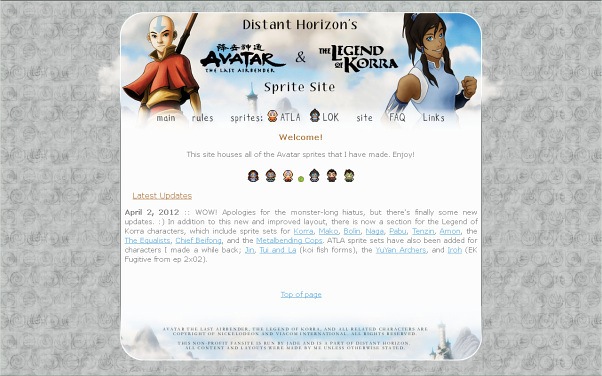 I also lazily run a number of non-ATLA sites, you can find them and more at Musogato.com.